On An Overgrown Path: Could LSD have saved Tchaikovsky? Could LSD have saved Tchaikovsky? Classical music and hallucinogens may seem an unlikely combination, but there is a reason why consciousness altering substances have featured in several recent overgrown paths. As was described in my recent post Elgar takes a trip, prior to the global proscription of lysergic acid diethylamide (LSD) in the late 1960s the drug had been used with promising results in experimental psychotherapy. Among those participating in the clinical trials more than fifty years ago were sufferers from severe depression. Statistics show that between 20% and 25% of adults will have an episode of mental illness in any given year and as a journalist who has experienced severe depression explained “…mental illness is a taboo…. few people talk about it or let on – unless they are so ill that they can't help it”. Depression can hit anyone, including musicians. Tchaikovsky was one of classical music’s many depressives, as the final tortured Adagio lamentoso of his Sixth Symphony testifies, and it has been speculated that his premature death shortly after completing the symphony was, in fact, depression triggered suicide. Hallucinogens were demonised because of their adoption by the counterculture, and there has long been a view that their proscription has been a barrier to legitimate and important medical research. This view has now been officially recognised and two authorised clinical trials have been started in America using psilocybin in experimental psychotherapy. In a recent Independent article journalist and cancer sufferer Erica Rex recounted her experiences with psilocybin as a volunteer at one of the studies at Johns Hopkins University Behavioural Pharmacology Research Unit in Baltimore. Erica Rex’s experiences at the clinical trial were overwhelmingly positive, and she explains that “psilocybin works by providing a neurochemical bridge between spiritual guidance and talking therapy”. This is particularly interesting as there is evidence that a similar bridge can be built by non-chemical spiritual practices, giving further support to the use of alternative therapies including music in palliative care. Depression is a serious subject that needs to be discussed more openly, and credit goes to Erica Rex for writing about it so frankly. However let me end on a lighter note. In her article she reports that psilocybin “allows patients a mini-holiday from their own egos” - which is a persuasive argument for making hallucinogens compulsory for everyone in the classical music industry. * Esoteric trivia: the number three is in the ascendant - this is post number three thousand On An Overgrown Path and the traffic counter is nudging three million page loads. According to the cosmology of G.I. Gurdjieff - see diagram above - the energy in the universe interacts according to predetermined laws, with the Law of Three controlling the balance between the three fundamental forces - the Active, Passive and Neutral. Opinions will differ as to how the balance between those fundamental forces has been maintained over the past three thousand posts. But I thank you, the readers, for travelling with me down all those overgrown paths despite any perceived imbalance. Talking of which, my header image leads down yet another path. 4,5 and 6 by Mravinsky are surely landmark recordings whichever benchmark you employ. When I first heard the mono group, with Sanderling in 4, I couldn't believe the intensity and virtuosity that erupted out of the vinyl grooves. Hearing good and even great performances by, say, Jansons or Karajan, is rewarding. But going back to these incendiary performances, that stand the test of time, is just about as rewarding as recorded music can get, I feel. Mahlerman, I can only echo your comments about Mravinsky's "incendiary performances". There is a particular skill in making this type of white-hot reading work. 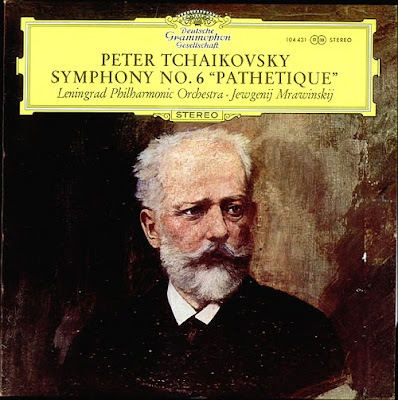 Much as I admire Barbirolli, I have to say that I find his 1957 Tchaikovsky Fourth Symphony (currently available in EMI's Great Recordings box) simply too overwrought, whereas Mravinsky somehow pulls it off. Something to do with Russian blood perhaps?